Our latest clients wanted something unique that reflected their family’s personality. Gold Coast Shopfitting worked with these guys to help them to create their vision. They wanted a special one of a kind unit to display their most treasured items. 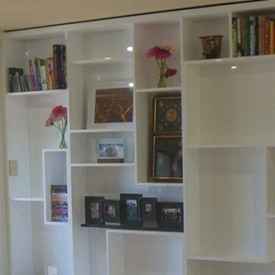 This beautiful unit is finished in a 2-Pac white gloss; the guys at Nerang Gloss did a brilliant job as usual. The drawers have been fitted using a high quality heavy duty ball bearing runner with a “touch to open” feature. The bottom edge of the drawers also has a finger pull access. The request of wine storage in the drawers was noted and reflected the size and depth of each drawer as well as a little rack to make sure those bottles didn’t roll around and wake everyone up on Saturday night! Click the image below to see photos of the wall unit.